Get ready to see landscapes and history that you cannot see by airplane or motorcar. Climb aboard a luxury railcar and get a front-row seat to witness breathtaking views of the Canadian Rockies. Roll through the unspoiled wilds of Scotland or set eyes on the villages in Switzerland. Now relax as we take you through the 6 most scenic train routes in the world. 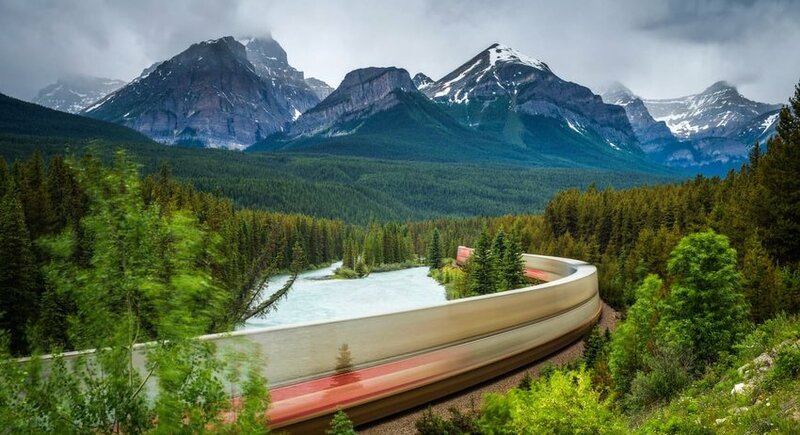 This breathtaking train route will give you access to some of the most awe-inspiring views ever! Take in landscapesof snow-capped mountain peaks as the Rocky Mountaineer takes you from the shores of the Pacific Ocean to Banff, Canada’s majestic National Park. You will set out from the cosmopolitan city of Vancouver and weave alongside steep canyons ending up in the untamed wilderness of the Canadian Rockies. Along the way, you will be spoiled with 1st-class service, food, drinks, and scenery as luxury meets the Canadian wilderness. 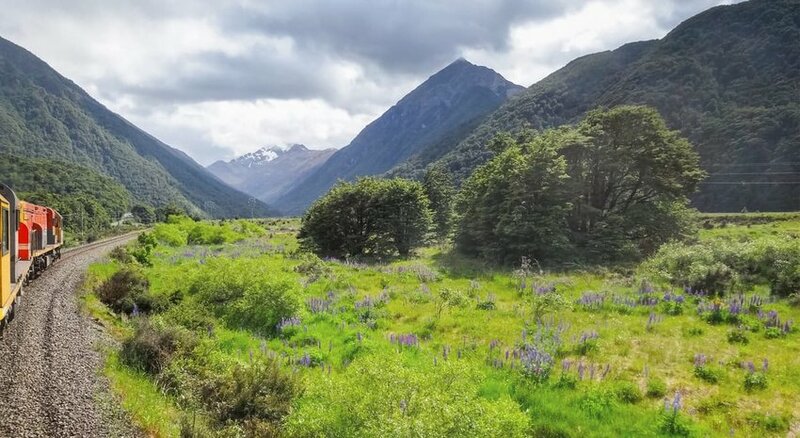 The only way to take in the Southern Alps of New Zealand is aboard the TranzAlpine, New Zealand’s super rail journey. Climb aboard and experience the South Island’s stunning natural landscape. Along this journey from Christchurch to Greymouth, you will witness epic vistas, voyage along the edges of the ice-fed Waimakariri River and wind through miles of native beech forest. The perfect stop along the way is Moana, which is set amid a remote mountain paradise midway between Arthur’s Pass and Greymouth, and home to the idyllic Lake Brunner. This trip will certainly be a journey of a lifetime. 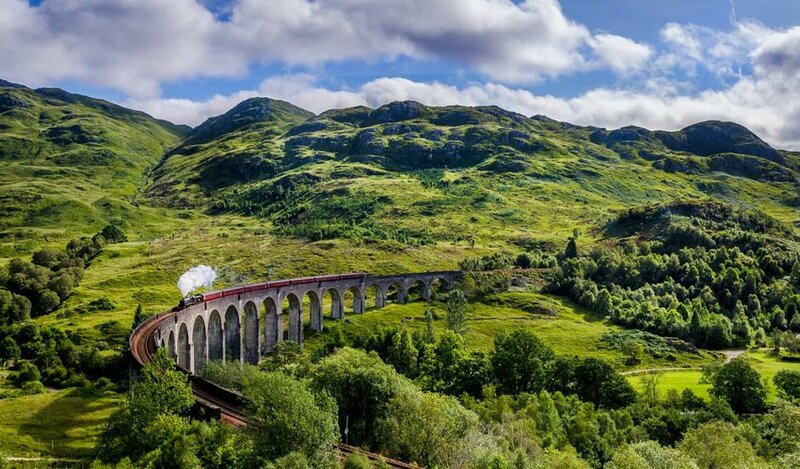 Fans of the Harry Potter movies will be departing from Platform 9 ¾ for a trip to the Scottish Highlands. The West Highland Line is a terrific way to experience Scotland’s western coast. You will set off from Glasgow and wind your way through verdant glens and serene lochs. After a trip through secluded heather moors, the train will pass Ben Nevis, the highest peak on the British Isles. If you would like a wee dram of Scotch, make sure to take a tour of the Ben Nevis Distillery and experience “Uisge beatha” – the “Water of Life”. 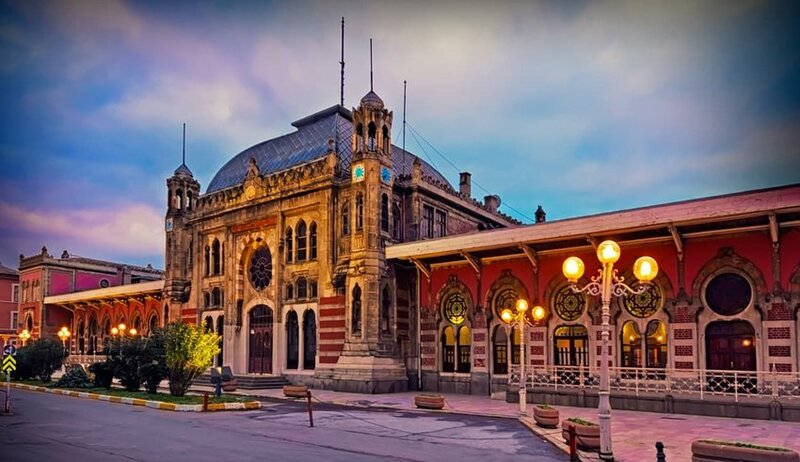 The Orient Express has been associated with both stylish adventures and the golden age of travel for more than a 100 years and its celebrated route takes you between the two most exotic destinations in the world—Paris and Istanbul. Now, we can journey across Europe and into Turkey’s most famous city in a rolling luxury, style and comfort. But you need to really plan this one out because it only makes the journey once a year. Once on board, you will be transported back in time as you explore a collection of romantic cities such as Paris, Budapest, Bucharest and Istanbul. The Trans-Siberian Railway is arguably one of the world’s most amazing railway journey’s. It runs across a once secretive Soviet, connecting East and West. 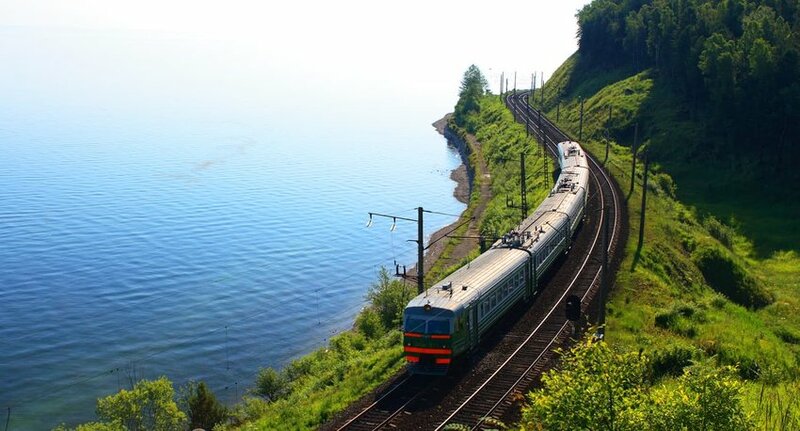 This iconic train route runs from Moscow over the regal Urals, across the magnificent and endless plains and ends at the port city of Vladivostok. alongside the shores of Lake Baikal, the world’s largest freshwater lake. Start your visit with a couple of days in Moscow and take in the grandeur of the Kremlin and see the treasures of the Tsars in the Armory Chamber. As you roll on west towards Vladivostok, a stop at Lake Baikal will leave you speechless as you stand on the shores of the crystal-clear waters of the world’s oldest and deepest freshwater lake. End the very long run by taking in the still waters of the sea surrounding the historic city of Vladivostok. The Glacier Express has to be on any list of greatest train journeys in the world. 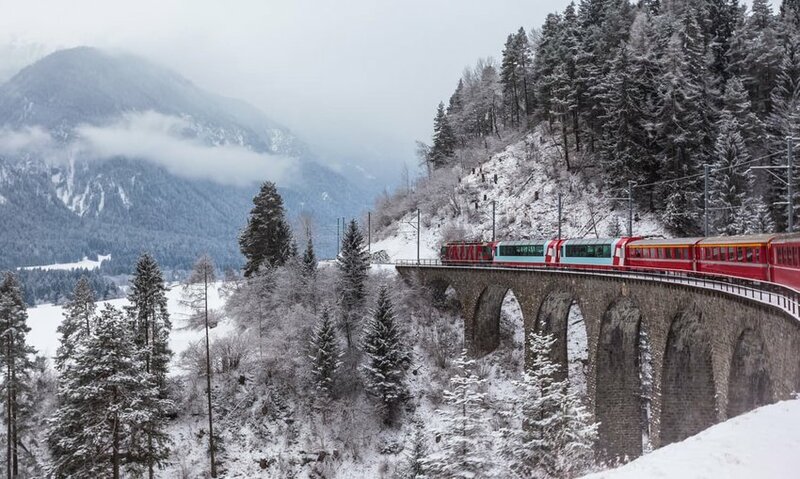 Express is just a word here, as this train is billed as the “slowest express train in the world.” The route takes you across 291 bridges and through 91 tunnels, up to the mile-high Oberalppass. Travel in comfort as you soak in the traditions and centuries-old Swiss culture. You will be given a front-row seat to the “Window of the Alps” as you travel through the unspoiled natural beauty of a land rich in ancient, fragrant mountain forests, idyllic Alpine meadows, and roaring mountain rivers. Highlights of the journey include stop in St. Moritz and the alpine village of Zermatt where you can take in breathtaking views of the Matterhorn. The Paris-Istanbul run is on my list!